Artful Inspiration! Be inspired!! It is the most valuable of creative skills! Click here to view my recent video on how I am inspired by abstract painting! I like to define inspiration as an up-lifting idea that has the potential of inspiring others and produces an end-product that broadcasts hope, creative confidence and happiness. 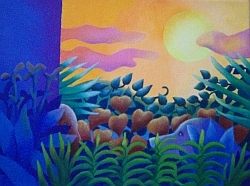 In working on a series of paintings, I am aware that all have come into being by some seed of inspiration. In all of them, I employ the same skills and techniques and the subject matter is a theme that unites all of them. Lately my paintings have been dealing with my observations of the things in my life that are beautiful and important to me. I’ve done a painting of the plastic quart-size pitcher I use to make the refrigerator tea. Sunlight is shining through the semi-translucent container and pooling around the base, which is half-shrouded in a dishtowel. I think most people like this painting for what inspired me to paint it: the humility of this dollar store item transformed into a kind of spirituality by the slant of early morning sunlight illuminating is watery contents. The deep green of the dishtowel embracing the base of the pitcher and the counter interlaced with blue shadow-patterns from the windowpane in the background. I can’t say where my next inspiration will come from. Perhaps it will be the house next door at dusk, a street light glowing in early morning blue haze or sunlight through a living room curtain. I am always on the look out for the thing that inspires me, grab my camera, take a photo to capture the scene and print it out on my computer. I have a large and growing collection of photos which are all candidates for becoming a painting or drawing. Here is my article on "New Perceptions In Art Through Neuroscience Research." To see THIS article and many others art information-rich articles I've written, click here! Looking for artful inspiration? Ask yourself, what inspires me to create? Painting inspires me! The colors, the brushes, the canvas! Oil is a fantastic medium to use to depict light, dark and color gradations! The advantage of oils over acrylics, especially for the technique I am using, is that oils don't dry fast and have a nice matte finish when dry. A gradation from green to red, for example, can be done in either oils or acrylics by blending to the colors together to make a seamless transition. The wet-on-wet- gradation in acrylics must be done fairly quickly with acrylics, because they dry fast. It will work well, but once it is set up and dried, the blending is over. There are retardants that can be used to to deter drying time in acrylics and this will help when altering the blending technique to do more blending or change the blending. 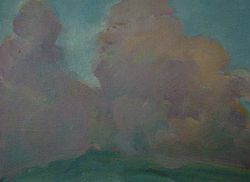 With oils, the same gradation can be made, taking about the same amount of time, but a return into the blending technique to change it can be done because the painting is not dry. On the other hand, a BIG change in the blending technique, for example changing a gradation of green into red to a gradation of blue into yellow, cannot easily happen in oils, because all of the paint is still very wet and to go over what you have painted with other colors will just blend them altogether. When a student doesn't know whether to work with acrylic or oil paints, this information is helpful. I teach acrylic painting techniques and, in presenting the various skills and techniques they will need to pain with acrylics, I also introduce the time clock which is always present with quick-drying paints. I ask my drawing students to keep a sketch journal. They soon learn to jot down an image and take notes on their thoughts of what caused them to notice this particular thing and why were they inspired by it? In this fleeting world, they make a simple documentation: a quick drawing and a few words that will capture the image and their response to something that flickered bright in front of them for an instant and then vanished. The world is full of flickering and vanishing images and ideas that pass by very quickly and usually escape our notice. In a month’s time, a student will fill a sketchbook with images and notations and, we are always amazed by the amount of inspirational material that has been accumulated. The transformation of a sketch to a finished drawing or painting is a long journey and many changes are made both in concept and technique along the way. Regardless of the metamorphosis engendered by the act of creativity, what remains is the inspiration. It began with the first spark, the initial impulse to put down something that touched the mind and seized the heart, if only for a brief second and ran like a surging river through to the end when the artwork was finished and complete. And if the inspiration has remained strong throughout the creative process, it will affect not only the artist, but the viewer as well. And the Internet is a vast repository of inspirational images! I still collect images from magazines and photos, but I pull many online images into my Pinterest account. It is both a reference of my past and present artwork, but also the source of my future artwork. For me, inspiration is sometimes verbal. Instead of the image becoming a painting or drawing, it becomes a poem. The process seems to be the same: first the spark, the urge to record it and make more permanent the fleeting sweetness of it. Then the sometimes arduous process of translating it into that more stable realm begins, with the wish that, in the end, others will read or view it and feel that spark, too. Here is my article on "The Fragile Quest" To see THIS article and many others art information-rich articles I've written, click here! This is a luxurious morning. Taking in the pale golden light. And sit in the silence feeding on each rich minute. This day is not circled on the calendar. There is no appointment with the time underlined. My clock ticks in the bedroom. A jay calls from the back yard pine tree. Another jay answers from far away. Vanilla quiet sweet on my ears. And taste the primal fragrance of time. The saffron silk of eternity. Here a some great books on inspiration in painting. You can easily view and purchase any of these books by simply clicking on the Amazon logo! I'm 50 and going to retire soon. I always wanted to be able to draw so now is the time. I saw your website and you sent me the classes link.What you said about my work I sent you was right on! Our Girl Scout Troop did the landscape drawing lesson at Camp, then we had a show of their work. Even the counselors were impressed! I never thought I enjoy so much abstract painting! The color, brushes, I love! Thanks! ----- Good Day Lois, I want to thank you for the clear instructions in your online oil painting classes. I have not yet had a chance to do all the exercises, but I have read (at work) them carefully and I think you are a wonderful teacher. Your havemade the instructions simple and yet comprehensive. I have recommended your site to another beginning artist to complement our class work. I am particularly interested in the intermediate class and I hope to incorporate your teaching into my next painting. Thank you for your generosity of spirit in sharing your knowledge. I am truly amazed by 1.- your response and 2.- your prompt response. There is so much BS on the net today that I wasn’t sure if you we’re legit or not. Now your comments on my work gave me a super-boost. Thanks a lot, merci beaucoup! As for the unfinished portion of the canvas, I took this as an exercise and didn’t see the point in “wasting” more paint. This is my first try and don’t really think it will ever reach the Louvre. Again thank you very much, I really do appreciate, my donation is on it’s way. Oh and a little question: I skimmed over all your lessons and did not find any info on mediums (linseed oil etc.). I am truly in a fog as to the use of those different products. Do you know any place I can find info on these like what they do, when to use them etc. Thanks again. "Why do people think artists are special? It's just another job." "I had reservations about making art a business, but I got over it."